False-colour map of the density of stars with 0.1 < g−r < 0.45 from the SLAMS survey. Density in different magnitude ranges is shown using different colour channels: red 20.5 < r < 23.0, green 17.5 < r < 20.5 and blue 15.0 < r < 17.5. The newly discovered stream is labelled. The dotted line shows the future orbit of the LMC, calculated using Kallivayalil et al. (2013) proper motions, which is roughly aligned with the orientation of the Jet stream. The green/blue colour gradient along the southern edge is due to the varying distance distribution of MW disk stars. Credit: Jethwa et al., 2017. (Phys.org)—An international team of astronomers has detected a new thin stellar stream in the halo of the Milky Way galaxy. The newly discovered feature, named "jet stream," could help researchers answer fundamental questions about the mass distribution of the Milky Way's dark matter halo. The finding was presented November 24 in a paper published on the arXiv pre-print server. Stellar streams are remnants of dwarf galaxies or globular clusters that once orbited a galaxy but have been disrupted and stretched out along their orbits by tidal forces of their hosts. So far, nearly 20 stellar streams have been identified in the Milky Way, just a few in the Andromeda galaxy, and about 10 outside the Local Group. Astronomers are interested in finding new stellar streams in the Milky Way, as they hope that such features could answer some crucial questions about the the galaxy. For instance, stellar streams could help us understand the large-scale mass distribution of the galactic dark matter halo. Moreover, they could confirm whether or not our galaxy contains low-mass dark matter subhalos. Now, a group of researchers led by Prashin Jethwa of the European Southern Observatory (ESO) has found a new stellar stream in the Milky Way using the Search for the Leading Arm of Magellanic Satellites (SLAMS) optical survey. SLAMS utilizes the 4-m Blanco telescope at Cerro Tololo InterAmerican Observatory in Chile and is used to look for satellites of the Magellanic Clouds. However, the observations conducted by Jethwa's team in December 2016 and January 2017, have accidentally revealed the presence of a new stellar stream in the Milky Way's halo. 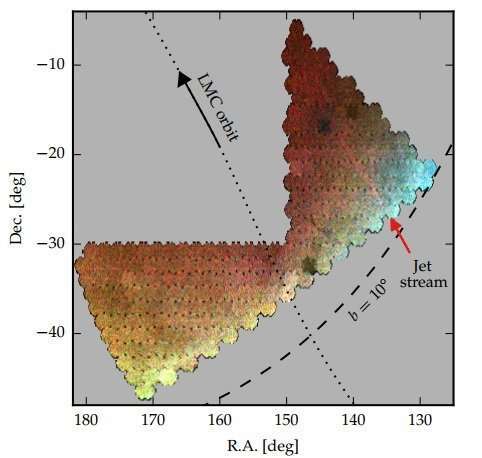 "We recently carried out a mini survey which led to the fortuitous discovery of a thin stellar stream in the outer halo, which we name the jet stream," the researchers wrote in the paper. According to the study, the jet stream is located about 95,000 light years away from the Earth and crosses the constellations of Hydra and Pyxis. The researchers estimate that the stream has a width of approximately 293 light years, which morphologically places it in the category of thin stellar streams along with Pal 5, GD-1 and ATLAS. The authors suggest that such thinness could indicate that a globular cluster was a progenitor of this stream. The research also revealed that the jet stream has a mass of about 25,000 solar masses, which makes it one of the least massive stellar streams known to date. Moreover, they found that the jet stream consists of mainly metal-poor stars, and its age was calculated to be about 12.5 billion years. Although fundamental parameters of the jet stream were determined by Jethwa's team, still more studies are necessary to further characterize it and confirm its origin. "Additional imaging is planned to attempt to trace the stream beyond the current survey footprint, followed by a spectroscopic campaign to determine radial velocities, metallicities, and detailed abundances, shedding light on the nature and orbital history of the progenitor. Finally, deeper, uniform imaging along the stream track will be required to robustly detect density perturbations caused by possible subhalo encounters," the astronomers concluded. We report the discovery of a thin stellar stream - which we name the Jet stream - crossing the constellations of Hydra and Pyxis. The discovery was made in data from the SLAMS survey, which comprises deep g and r imaging for a 650 square degree region above the Galactic disc performed by the CTIO Blanco + DECam. SLAMS photometric catalogues will be made publicly available. The stream is approximately 0.18 degrees wide and 10 degrees long, though it is truncated by the survey footprint. Its colour-magnitude diagram is consistent with an old, metal-poor stellar population at a heliocentric distance of approximately 29 kpc. We corroborate this measurement by identifying a spatially coincident overdensity of likely blue horizontal branch stars at the same distance. There is no obvious candidate for a surviving stream progenitor.